This is RonHaleEvans, judge of the eighth community piecepack game design contest, Where No One Has Gamed Before. I'm pleased to announce the winners of the competition. See below for discussion about the contest and each winner. This was a great contest. There were a lot of well-designed, fun, and innovative entries, many of which are worth trying. A few more need just a few fixes or a bit of playtesting to polish them. 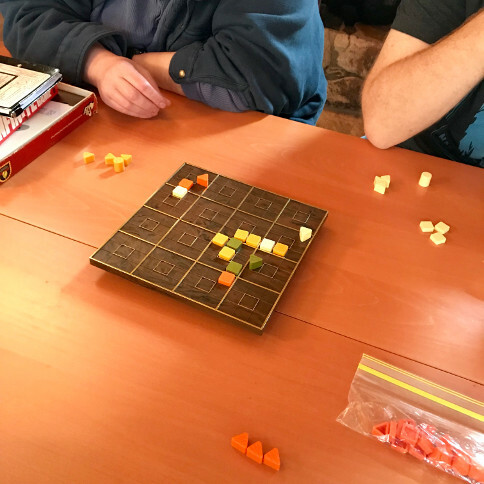 And there was extensive and heated discussion among some of the playtesters about which entries should take Gold and which Silver in both categories. Multiple playtesters stated their interest in playing both the Gold and Silver games below repeatedly. In previous contests, I was always disappointed when I didn't receive feedback about my entries, so I'm going into some depth below on my decisions about the winners, followed by a few comments about the qualifying items that didn't win. I hope this will be helpful to the games' designers, and maybe even to other designers as well. I'll gradually add more comments about all items on their individual wiki homepages as I have time. Finally, I'll list the games that were disqualified. Tingle is a fun, solid alignment game like Gomoku or Renju, with a couple of interesting twists, such as the choice to strategically swap pieces for other types of piece. 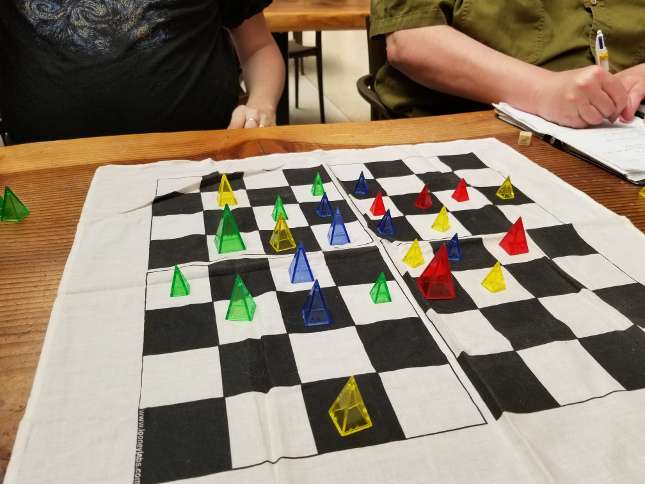 A four-player game among experienced players can take about half an hour, so this is a relatively fast game, but it is also relatively deep -- you can keep learning emergent strategies for some time. 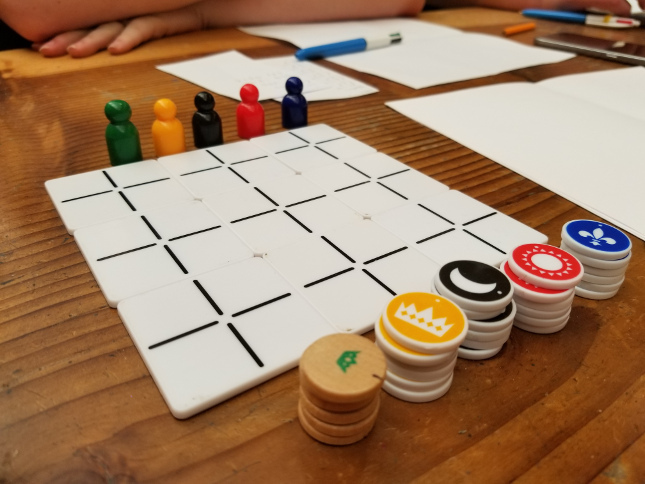 Setup time is minimal, and because the game is quick and the ruleset is short and easy to learn, it's an ideal game to break out after you've finished another piecepack game but before you put the pieces away. Chris Goodwin I've got a game that I've designed for three systems: Piecepack, Looney Pyramids, and Sly. I'm not sure if that's enough of a novelty to qualify it for entry here, though. 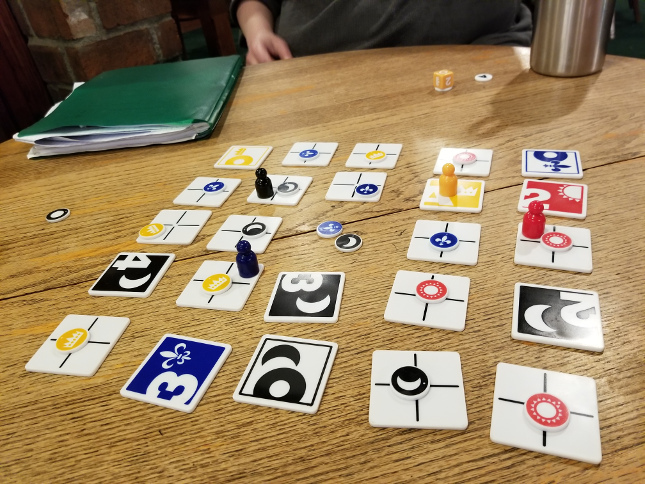 In effect, Chris took the intersection of the affordances (capabilities) of three different game systems -- piecepack, IceHouse, and Sly/Realm -- and created a new "conceptual game system" from these shared elements. In that system, he designed a theoretical game, then implemented this unplayable theoretical game as three concrete games, one in each of the three existing game systems. Note: If you're a software developer, think of the conceptual game system in terms of "abstract classes" in Java programming. I tried to avoid using "abstract" in this context, because it already has a meaning in game design. I welcome suggestions for alternative terms. Think of it this way: Have you ever seen an animal? You've seen dogs, octopuses, and roly-poly bugs, all of which are kinds of animal, but you've never seen an abstract animal as such. The conceptual game system Chris developed (I'm going to dub it Psi, for piecepack/Sly/Icehouse) is like an animal in the abstract, while the three concrete game systems are like the very real dogs, octopuses, and isopods you might have encountered. Chris's game design accomplishment is (metaphorically) to consciously develop an environment in which dogs, bugs, and octopuses can all three live and breathe simultaneously. This is quite a weird and delightful way to design a game, but Chris would not have won unless Tingle were also a solid, playable, fun game. Chris hit both marks. No other game in the contest gave me such unexpected things to think about as Tingle did. I've begun sketching a game myself at the intersection of the Decktet and Packtet (below), but that will have to wait a bit. I hope one day Chris will create a Tingle Director's Cut, with a commentary track encompassing Tingle the piecepack game, and its Sly and Icehouse counterparts Ting and Tink -- not to mention the abstract game at their intersection, which I'll call Tin. 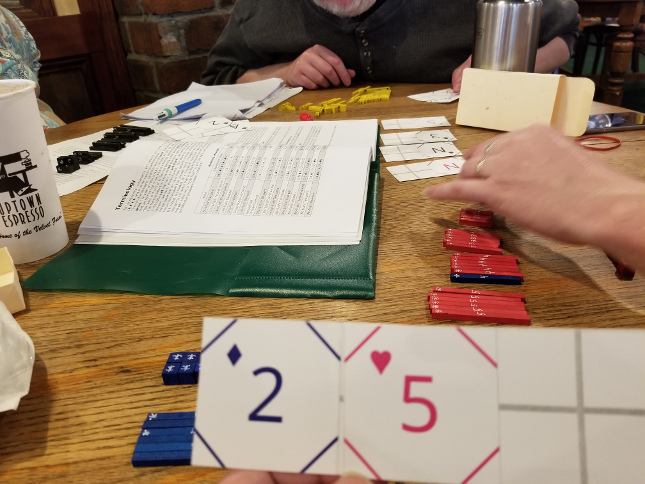 Refinements: Tingle bills itself as a game for two to four players, and the board sizes in the three game systems range from 8x8 to 10x10 to 12x12. It turns out that the two-player game is so fast and simple that it's better suited for children. Older players will find it easy to end the game without even bringing out all the types of piece, so it's not really recommended. 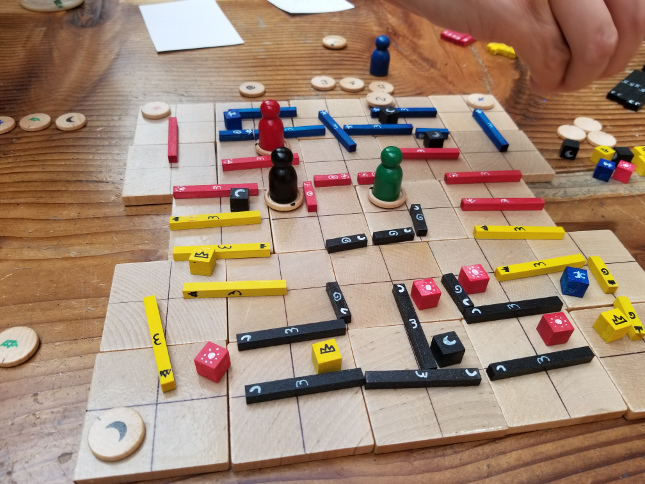 The three-player game is more playable and significantly more fun because of emergent social strategies, but the game really shines with four players. 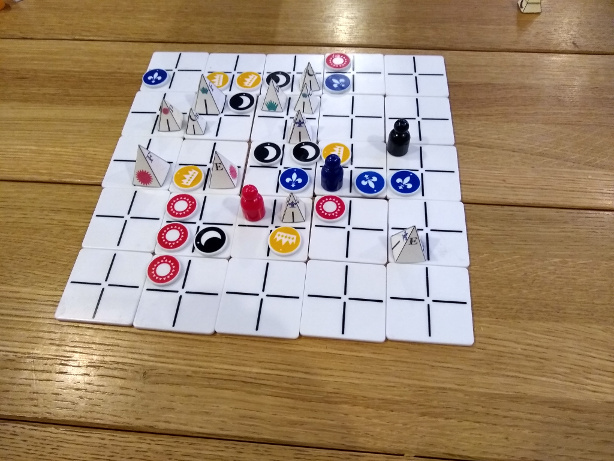 Also, I recommend playing on the 8x8 or 10x10 boards rather than the 12x12, because bigger boards make for faster games with less player interaction. Desfases is the most mechanically innovative game in the contest, and therefore takes the Silver. 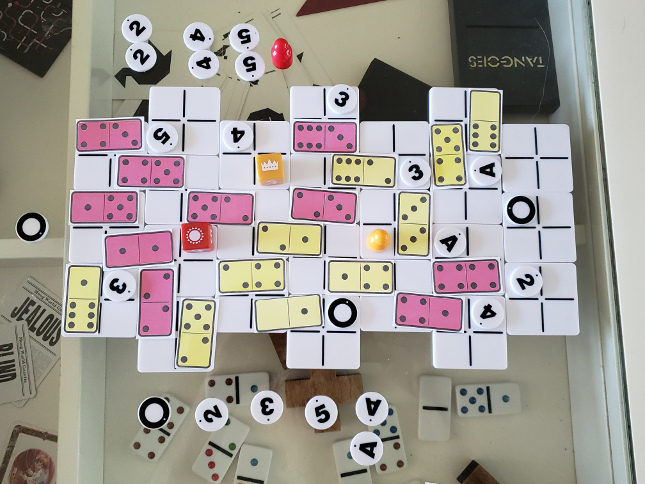 A game of Desfases is almost literally dizzying; as the players' pawns zip around, every tile on the board rotates at a different, player-controlled rate, spinning now faster, now slower, depending on events in the game. The object of Desfases is to claim as many high-scoring tiles as possible, but you can only score them if they're pointing toward you when you land your pawn next to them, and all too often they're desfases ("out of phase") from your pawn, thanks to your opponents. All this spinning and skipping around the board while trying to score a sweet tile makes for a highly tactical experience, much like (I imagine) trying to land a jet on an aircraft carrier on a windy, choppy day. Then again, at times I felt like a hovering hummingbird, waiting for a blossom to open. We mostly played four-player Desfases, which is great. Alas, we found the three-player version of Desfases to be unplayable. However, the two-player version is even deeper than the four-player version. I had the pleasure of having various bloody chunks of my anatomy handed to me by playtester Jami, who developed her two pawns (in a four-player game, you only get one), so that she could block my pieces with one pawn and score with the other, or pin tiles in place with her blue pawn so she could score them with her black pawn, and then reverse their roles. Very adept. What other strategies and tactics does this game hide? One refinement we adopted was to flip tiles over when they're scored, so that we could more easily navigate the available tiles and to remind us not to spin them. It's also important to remember to spin tiles at the beginning of each turn, so we all took responsibility to remind each other to do it. I recommend both the four-player and two-player games highly. Play is easy to learn while containing tactical depth, and the tile-spinning mechanism is unusual and innovative. Congratulations, Antonio! These unassuming little colored sticks have a huge amount of potential, as described in designer Dan's thoroughly thoughtful, illustrated, introductory document for the expansion. Dan provides an intriguing variety of possible uses, particularly in terms of board modification, but also including uses for functions like scoring. Dan's introduction also showed the geometrical thinking that went into the expansion and explained how to make your own set. Even better, the expansion was accompanied by a proof-of-concept game that required its use, Piecepackman. Although the Piecepackman game was flawed in actual play, it convincingly illustrated at least two different uses of the expansion (maze walls and turn order markers). In addition, we used the matchsticks instead of poker chips when we were playtesting Dual Piecepacks Poker. As a requirement of the contest, Dan sent me a complete set of painted wooden sticks that even came in a handmade box. Very nice! We were impressed by the integrity and versatility of Piecepack Matchsticks. We hope piecepack game designers will start using them in their games, and that some manufacturers will start selling them. If not, they're available as print-and-play with cardstock, and they're also 3D-printable. You have no excuse not to make your own set! Like Piecepack Matchsticks, the Packtet is a versatile, promising expansion and was thus awarded the Silver. Antonio included a list of possible uses, such as new, independent suits; shared tiles; and transitions between pure suits. Unfortunately, time pressure meant he could not also submit the recommended sample game for his expansion. Moreover, the Packtet is clearly modeled on the Decktet, which is terrific in one way, because the Decktet is a great game system and it's fascinating to see that functionality brought into piecepack. On the other hand, however, it doesn't meet my definition of innovation as fully as the Gold winner does. Nevertheless, I'm looking forward to designing with the Packtet, and I hope other people design with it too. I'd like to see a cleaner vector version of the graphics, maybe with the help of piecepackr (see below), but the existing graphics are quite nice. They match the original printable sets on Piecepack.org and feature "3D" effects that really pop. Congratulations again, Antonio, for two impressive winning entries -- Desfases and Packtet! Actually, not so much a game as a way of adapting existing Poker variants like Five-Card Draw and Omaha to the Dual Piecepacks expansion. Pretty neat -- Trevor supplies a cheat sheet with lots of weird new Poker hands, what they're worth, and the odds of getting them. For example, a hand with no pairs is now better than a pair! Unfortunately, Trevor doesn't provide complete rules for any Dual Piecepacks Poker variant, and piecing one together on the fly from his scattered instructions is somewhat tricky. It would also have been nice if he had warned people that every player should have a copy of the cheat sheet for DPPP hands. 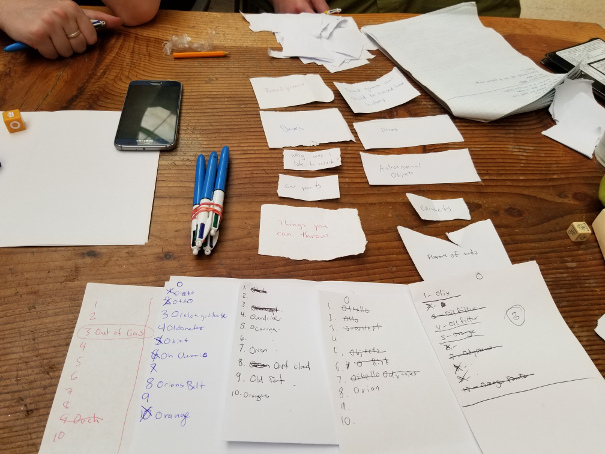 When we were out playtesting at a coffee house, we didn't have access to a printer, so we only had one cheat sheet to pass around, making the game almost unplayable for us. In any case, the new Poker hands, while fun and mindbending, are frankly kind of cumbersome. They're an interesting mathematical idea, but in practice are frustratingly complicated for poker novices and frustratingly different from normal poker hands for experienced players. Nevertheless, with a bit more work on the designer's part, Dual Piecepacks Poker might fit well into a night of novelty poker games such as Low Flying Outhouse, Double Jesus, or Follow the Mopsqueezer. You can even try Dual Piecepacks Follow the Mopsqueezer if you're aiming for a cerebral hemorrhage. Note: It's interesting to me that of Trevor's contest items (I won't say "entries" because I entered piecepackr into the contest myself as a surprise), his more general items are more successful. I'd say piecepackr (most general) is more successful than Dual Piecepacks (more specific), which is more successful than Dual Piecepacks Poker (most specific). Trevor is obviously a thinky guy with an eye on the big picture. TrevorLDavis says you can use this deck to play Dual Piecepacks Poker. The showcase game for the first-place expansion Piecepack Matchsticks. Unfortunately, not as good as the expansion itself. Although the maze shows off the matchsticks nicely, building the board is tricky -- it takes a long time and a lot of manual dexterity. 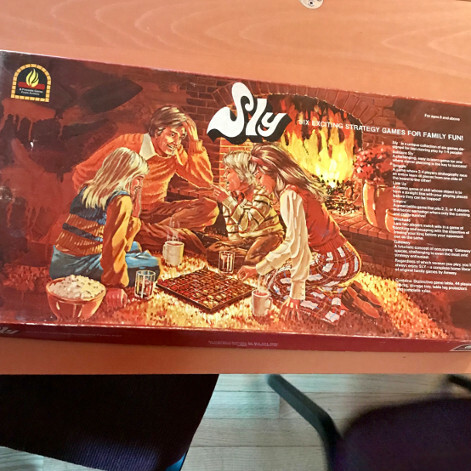 The designer himself warned that the three-player version is broken. 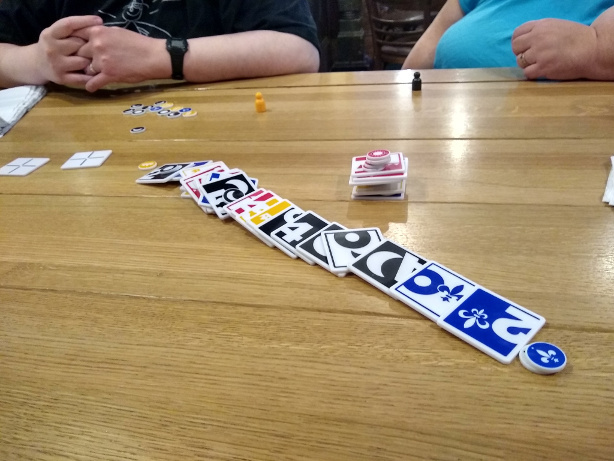 (Designers seem to have trouble designing for three players.) Playtester Paul showed mathematically that the Piecepackman character moves much faster than the ghosts (the players) and will consistently beat them. (Math available on request.) However, a glance at some of the variants seems to show that the Piecepackman character is not always so fast in them. I might like to try a solo game in the near future. A lot of work obviously went into this game. Nevertheless, aspects of it seemed rushed. I wish Dan had put more time into playtesting, even at the expense of some of his nifty diagrams. Maybe in 2.0! 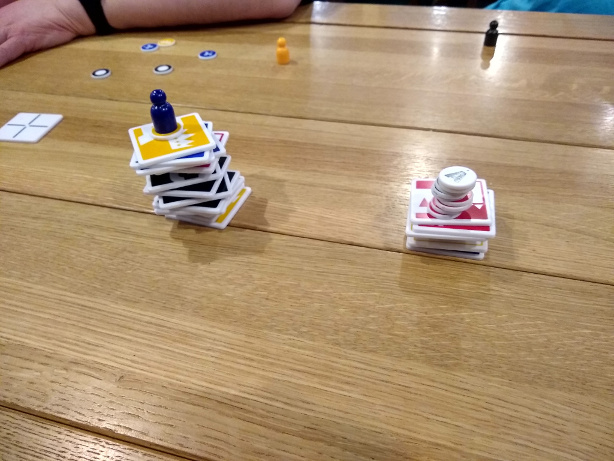 A light, fun, tower-stacking dexterity game. Think Jenga as a genre and you won't be far off. If you knew how much I hate Jenga, you'd know how surprised I was to enjoy this game. The innovative rules for which suits and values can be stacked on which others make this little entry surprisingly strategic in real time. Additionally, the normally-serious playtesters involved were observed giving this one plenty of smiles and laughs. You can play Speedy Towers multiple times in an hour and still have plenty of change left over. Recommended! This game is a bit of a mess, but I have hopes the designer will clean it up post-contest. The first time I tried to play this (with playtester Karl), we couldn't make sense of the rules. 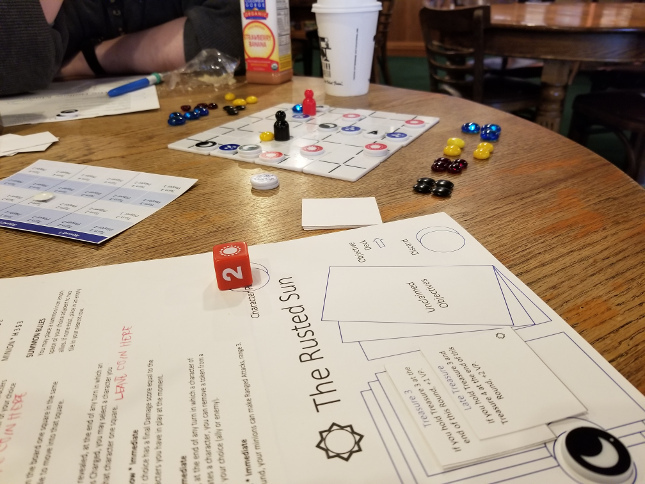 I had to ask designer Chris upwards of 20 rule-clarifying questions before I and playtester Paul could understand them and make a second attempt. Once you do get going, this is a quick miniatures "skirmish" wargame. However, the amount of fuss necessary for setup, not to mention the considerable print-and-play, might outweigh the quick fun of the game for you. However, it might be some consolation that the print-and-play components look really cool. If you're a fan of, say, Warhammer 40,000 and you're looking for something comparable to do with your piecepack (on a smaller scale, of course), I recommend you wait until Chris cleans up the game, and then give it a try. On the other hand, if you're a piecepacker in search of an intro to miniatures wargaming, something this game really, really wants to be, I can't recommend To Pieces. The following three entries were disqualified for various reasons. Keep working, guys! The components, which are generated by piecepackr, are original and attractive, but this was submitted as a game, not an expansion. The only rules submitted were a link to Wikipedia. According to the rules of this contest, the winner has the right to run the next contest. I've run three of these contests now, and I'd like to enter one for a change. Chris Goodwin, let this trophy cup pass from me. Dan, might you consider running a parallel expansions contest or what you will? Antonio, if for any reason either Chris or Dan cannot fulfill his duties, I authorize you to take over. Let's get the next contest going, and not wait ten years this time! I am weeping with gratitude that I had the following people to playtest contest entries with me. Without them there would literally have been no contest. All of the photos were taken by the playtesters, too. They are all members or guests of Seattle Cosmic Game Night, and some are alumni of EGGS, a former local game design and playtest group. Playtesters: Yuri Button, Karl Erickson, Dennis Fisher, Marty Hale-Evans, Mark Purtill, Wade Rockett, Tim Schutz, Jami Schwarzwalder, Paul Schwarzwalder. Thanks to my wife, marvelous Marty Hale-Evans for a professional edit pass of these results, and as always, for her patience. Thank you to all the designers mentioned in the body of this post! I look forward to meeting as many as possible of you some day. And finally, thanks to James Kyle for inventing the piecepack and making this madness possible.